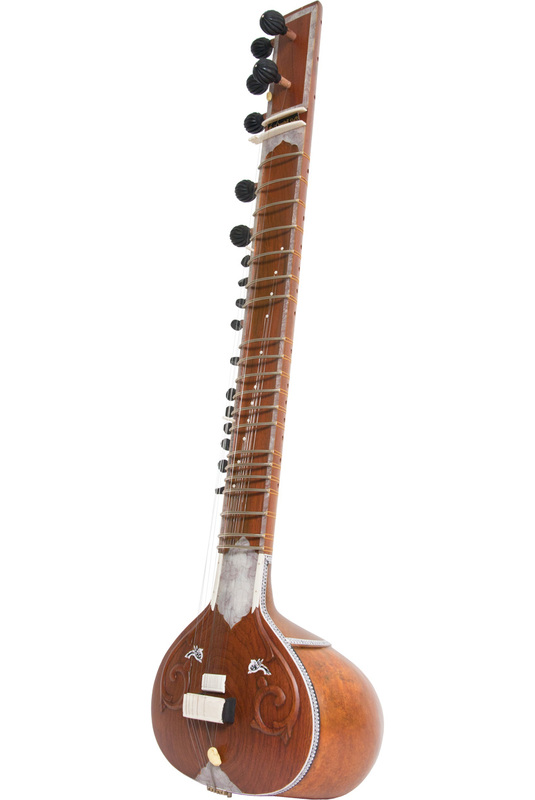 This single toomba sitar is from Bhargava & Co. It comes strung in the 6-string style; with 4 main, 2 chikari and 11 sympathetic strings, approximately 48-49 inches in length. Includes extra string set, mizrabs, information and tuning guide (Book or CD-Rom as stock allows), and nylon case. While most double toomba sitars are strung in the 7-string style and single toomba sitars in the 6-string style, you can change the style of your sitar by re-stringing it with the appropriate number and gauge of strings. Single toomba sitars, which have fewer inlays and fewer carvings, offer an elegant alternative to the double toomba sitars. Without the small neck resonator these sitars are less top heavy as compared to the traditional double toomba sitar. Bhargava & Co. was established in 1948 as wholesalers of musical instruments. Today they are a manufacturer and a leading exporter of musical instruments. Decorations and colors will vary. These are all individually made and will be unique.